MAOI: What do you admire in a person? afraid to be bold and try new things. MAOI: How long has this band been together? How many bands were you in before this one? Azad: About three years. Eric (drummer) and I have played music together for over 10 years now. We were in about 3 other bands together. These groups had horrendous names, but it all led up to what we’re doing now. MAOI. What movie would you want to live in for a day? Would you be yourself or another character? Azad: There Will Be Blood…I would want to see what it is to be Daniel Plainview…although that maybe a bit dark. MAOI: Favorite place to go; morning, afternoon, night? Azad: A peaceful place where it’s quiet, the wind is blowing, and there are plenty of beautiful things to look at. Eric: In the morning would be the Desert, best sunrise. Afternoon would be my bed. Evening would have to be an all you can eat buffet. MAOI: If you could go back in time and tell your 16 yr old self one piece of advice what would it be? MAOI: Have you ever witnessed a miracle, or what you would consider a miracle? Azad: Hmmm…wait, here’s one. Back in ’07 when I first began driving, A couple friends and I were once merging onto the freeway and were hit hard by an 18-wheeler truck…the truck dragged my car for a while and push it sideways. The guy said he didn’t see us and admitted being at fault. We came out of it with no injuries. I’m surprised we’re alive. MAOI: Is there something everyone loves and you just don’t get it. 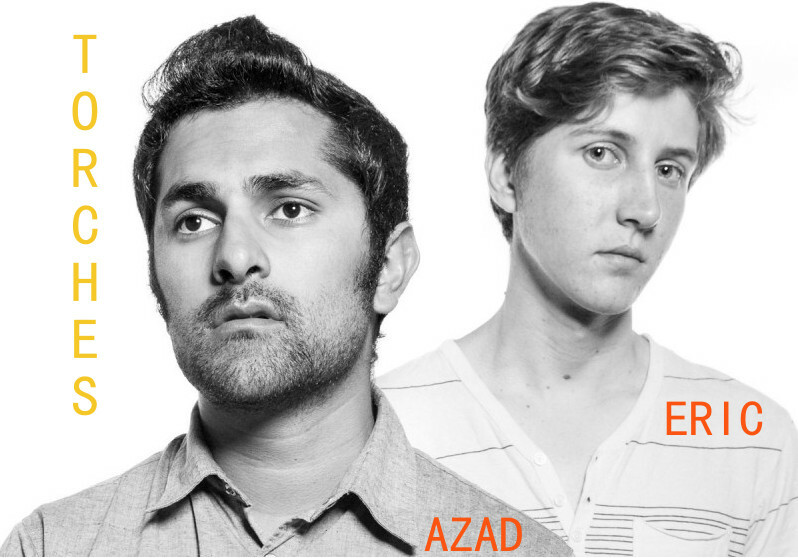 Azad: The band, Beach House? MAOI: How old were you when you wrote your first song/picked up your first instrument? Azad: I was 13 when I began singing and playing guitar. I tried playing percussion in 5th grade and gave that up shortly. It’s funny because now I appreciate music so much more and would like to play drums. I’m always thinking of ideas for beats. Eric: Hard to say, we’ve always had an out-of-tune player piano in the house, and whenever I tried playing it, my mom would complain. I got my first drum set when I was twelve. Azad: People that feel a sense of entitlement when they have nothing to show for it. MAOI: Loaded question but, why do you make music? Azad: I make music to be able to better connect with myself and the world around me…and because life would be boring without it. Eric: 2-3 years. 3 bands, all with Azad, I picked up the drums after he started playing guitar. After listening to Torches again and again turning over the imagery and emotions that the music inspires I’m left in a mental park with trees. Yes, listening to Torches is like jogging outside on a designated dirt path early in the morning. This is not an insult by any means, because if you’ve ever gone jogging in the early morning with the air still cool and crisp it’s completely invigorating. Your body wakes from the lethargy of a stressed life, leaving troubles in your bed, and finding comfort in the warmth of movement. Your face flushed with a healthy hue of pink. Torches isn’t a sprint though, its not aggressive, their songs reflect the steady build and rush of minor accomplishments. Creating bench marks to continue forward without “taking a breather”; that sign, the tree, the couple kissing on a bench that you need to pass before resting. Most of their songs end with that triumphant, yes I did it note where arms are up in the air. But don’t be fooled thinking it’s the music to jog to, its just the audio equivalent of a great jog through a beautiful park. Trees with changing autumn leaves and a squirrels running across dew filled fields with a precious acorns in their grasp; a modern sense of wholesomeness.Torches music is the introspective thought your contemplating, or at least I’m contemplating when I’m pushing myself forward saying I can do better, don’t stop, not yet. Search TORCHES on Spotify, the first album isn’t this band but Head Full of Rust and If People Stare is the above band. This entry was posted in MUSIC, Music : Prescribed and tagged indie, indie band, interview, kroq local only, LA local band, local music, Los Angeles, new music, positive, torches by B_MAOI. Bookmark the permalink.